UPDATE: Frankel powers up the Ascot straight mile for an eleven lengths Group one win and Lawman sires his first Group one winner in the St. James Palace Stakes! 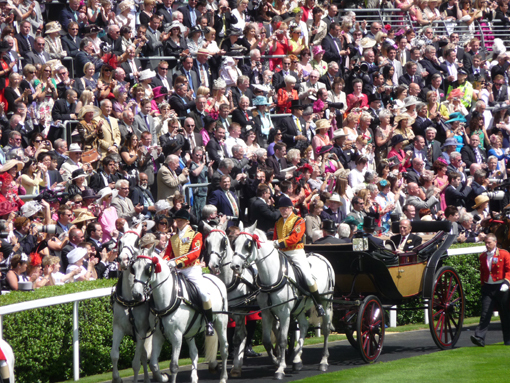 THIS is Royal Ascot - the Windsor Greys heading the Royal Parade. At Royal Ascot on Tuesday, Frankel proved he is one of the best horses ever seen by an astoundingly easy eleven lenghts win in the Queen Anne Stakes - and this is a Group One race. Now it is up to Black Caviar to follow suit in the Golden Jubilee Stakes on Saturday. That will then give rise to plenty of discussion as to which one derserves the World Champion Status the mostl. However, they are both wonderful athletes, currently on top of their game! Another great result, particularly relevant for us was the win of Most Improved in the Gr. 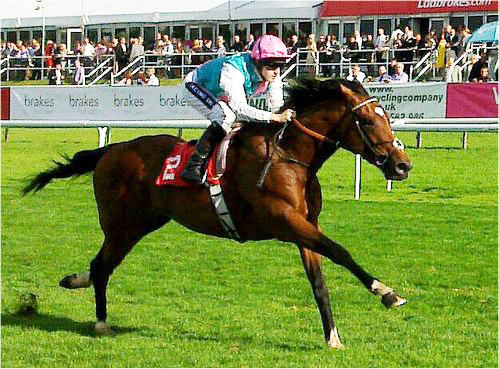 1 St James Palace Stakes. He is from the first crop of Lawman, a stallion we have extensively supported. We now eagerly await the first start of Orgilgo Bay by Lawman ex Third Dimension trained in Ireland by John Mc Connell. So far we have heard only positive comments on the horse. Apparently his stable name is Frankel, quite something to live up to!! On Wednesday a daughter of Cape Cross, Joviality won the Windsor Forest Stakes, Gr. 2 for Princess Haya of Jordan. 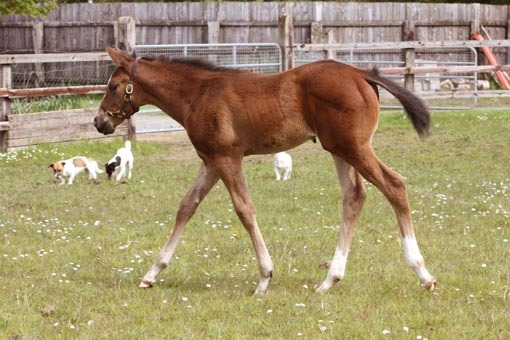 Lets hope for a lovely Lawman foal out of Ezalli (by Cape Cross) next year! 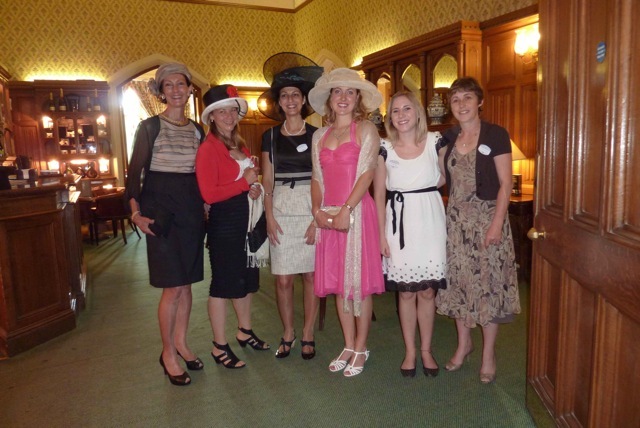 Below: our own Royal Ascot party in 2010! 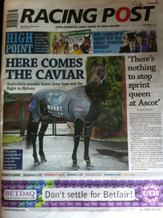 The unbeaten Frankel (left) and the in 21 starts unbeaten Black Caviar, in her rather scary flying suit (right). 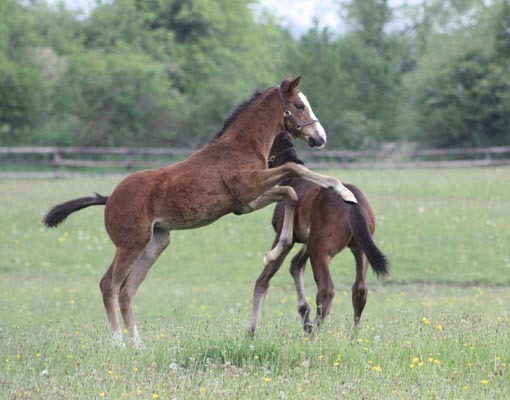 Fillies having playtime! La Musicas filly is now six weeks old. 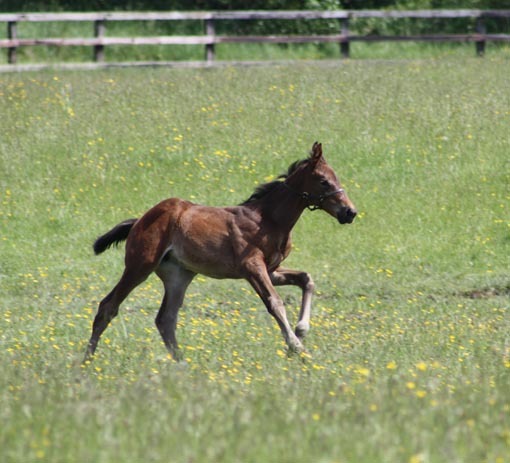 We are pleased to announce that we have added a new mare to the Swordlestown Little broodmare band. Ezalli is a five year old winning and Listed placed Cape Cross daughter from the famous Aga Khan family of Ebadiyla (Oaks winner), Enzeli (Ascot Gold Cup winner) and Edabiya (Moyglare Stud Stakes winner). This is one of the most successful Aga Khan lines which traces back to Albanilla and Tourzima, ancestresses of many Champions such as Darshaan (multiple Champion broodmare sire) and Darara (dam of four Group 1 winners and foundation mare of Andrew and Madeleine Lloyd Webbers Watership Downs Stud) but also Derby and Arc de Triomphe winner Sinndar. What we now need is the most important ingredient called LUCK! All foals are doing well but could do with nicer weather. The update is as follows: La Musicas strong and compact filly foal is by Areion, a German stallion who is by Champion German sire Big Shuffle. Big Shuffle was bred by Moyglare Stud in Ireland and was a multiple Group winning sprinter by Super Concorde when trained by Dermot Weld. Areion himself was Champion sire in Germany in 2010 and has an impressive strike rate of black type horses to runners of 6%. The last to foal was Dr. Rolf Schmids Romandie (by Monsun). 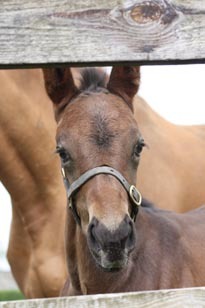 She produced the biggest ever foal at Swordlestown Little with her filly by Lawman. All mares except La Musica are pregnant and so we are hoping for six foals for next year. The good news from France is that Theola and her colt by Azamour are doing well and that she is in foal to Elusive City. 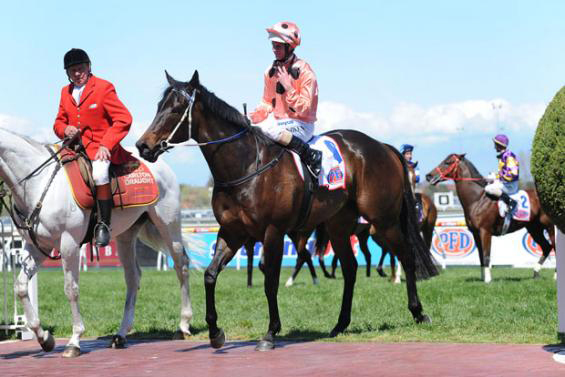 An important update is that Azamour had his first Group one and Classic winner with Valyra last Sunday. She won the Prix de Diane in a very convincing fashion in the manner of filly on the upgrade. We will probably see her next in Longchamp in autumn! This was a seventh winner in this fillies classic for her owner-breeder HH Aga Khan, a record that speaks for itself. Funny face and long legs! Lawman filly, one week old. Already practising to be a Racehorse . 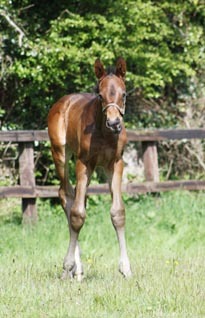 The Lawman filly at four weeks.